The house has been repainted and the kitchen and bathrooms retiled in 2017 to keep the house looking amazing. Stunning 6 bedroom, detached, luxurious holiday home. Ecclerigg Garth dates back to the 1850's but has been totally refurbished, leaving all the original charm of yesteryear. The property has 6 bedrooms split over 2 levels. All the bedrooms are on the same side of the house which makes it an ideal house for those with children. To the other side of the house is a brand new modern kitchen. New Granite surfaces have just been installed in 2016 making it look very classy. The kitchen leads to a separate utility room with a back door to the patio & garden. Downstairs also has a 14 seat dining room with a log burner and a separate playroom. Upstairs boasts a large magnificent feature lounge with a balcony that affords lake views. To the outside there is a patio with decking and a table that seats 14. There is a triple BBQ and outside lighting. The garden is enclosed and is more than ample for all your needs. If you are in the lakes for an activity holiday this is the place for you. We now also have the full Sky TV package for 2018 including all Sports and Movie channels. Leisure club membership is also included with your stay. The perfect location for everything. The property is a 5 minute walk from Lake Windermere and also a 5 minute walk from open countryside. Be it cycling or kayaking, the lakes has it all. 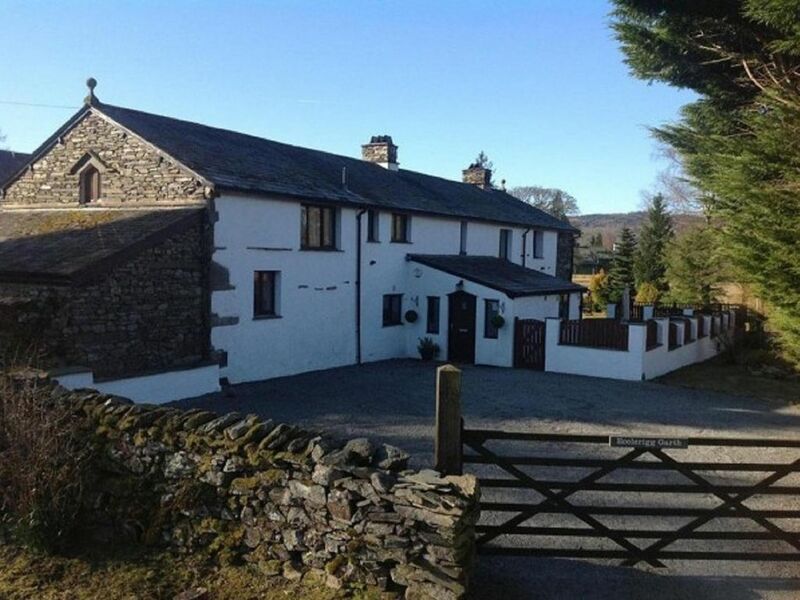 The house is also a 5 minute drive to Ambleside, Windermere or Bowness. *** SPECIAL OFFERS FOR 2019 *** Available weekends as we speak for 2019 26-29 April - £1500 (£35.71 per person per night) June 14-17 -£1500 (£35.71 per person per night) Oct 04-07 £1500 (£35.71 per person per night) Oct 11-14 £1500 (£35.71 per person per night) Last Minute 3 night midweek stays available in Feb, March & April 2019 for just £899 04-07 Feb 11-14 Feb 25-28 Feb 04-07 March 11 – 14 March 25-28 March 22-25 April 3 night midweek stays available in May & June 2019 for just £999 06-09 May 20-23 May 03-06 June 11-14 June 24-27 June Most of November and December 2019 still available for weekend, mid week or full week bookings. Swimming in the Lake - The best pool around. Full Sky TV Package. The benefits of the property are too many to count. The magnificent views from the garden, the patio area where you can just chill out. If you want to go shopping there are the beautiful villages of Grasmere or Hawkshead within 15 minutes. Walking in the Langdales the Fells above Grasmere. Climbing Helvelyn, Scafell Pike, the Old man of Coniston, Skiddaw Visiting Buttermere, Derwent Water, Ullswater. Cycling around Thirlmere or in the little known roads of Mungrisedale. Mountain biking in Grisedale forest. This is just the start. There is so much to do. Or you could just chill out in Bowness or Ambleside in one of the many coffee houses, pubs or restaurants. There are also 2 further bathrooms, 1 with shower and jacuzzi bath, and 1 with double shower. And 2 further wc rooms. We have the full SKY Sports, Movies package both upstairs and downstairs with separate viewing cards. Bikes can be stored under cover near the wood store and should be locked up, or in one of the garden sheds. Whilst the area is very safe we accept no responsibility for the loss or theft of bikes. Lovely house with lots of space. Great location and excellent communication with the owner. Would definitely go back. The property was in a great location to walk to the lake. Nice views to the left of the house and large garden. The beds very very comfy and all clean. Unfortunately though the property was very shabby and was not too clean inside. All the windows need a desperate luck of paint . We had to wash plates and glasses before we used them and the ovens were filthy . There was a broken glass in the cupboard that had not been removed . It would have been nice if a few logs were provided as a starter. The black chandelier was grey bit black due to the dust . The property was great for dogs. Overall really not worth the money unfortunately. The windows do get painted every few years but from the outside in particular they do get rather weathered due to the Lakes Climate. Beautiful house in a magnificent setting. Many thanks Julie and we look forward to seeing you again in the future. So glad you enjoyed it. My family and I stayed in this house for the weekend and it was absolutely fantastic. The house is beautiful and really well equipped. Everything we needed was there ready for us. We had two babies and two toddlers with us and the travel cots and a stair gate were also supplied. The garden is really lovely with a fabulous view and the house itself is in a great location. I would definitely recommend this house to everyone. Thanks Clare. We are delighted that you found the house and location to be 5 star and we appreciate your feedback. We work hard to keep the house in pristine order. Thank you. I booked the house for the weekend for my husband's suprise birthday and 12 of us stayed in total. The House is amazing! As soon as we walked in we were all stunned and wowed by it all. It was so much more than what i expected and all of us loved it! All the rooms throughout the house are lovely and it is a great size for a large group and has everything you need and more. The location is perfect and easy to find. We will definitely be returning next year and i would highly recommend the house to anyone, you will not be disappointed at all. It is simply stunning. We can't wait to come back, we miss it already! The house is 100 metres from the entrance to the National Visitor Centre. Amongst other things, this offers lake cruises to Ambleside & Bowness, a cafe, lakeside walks, as well as a great adventure playground and blooming gardens. Have a great day out overlooking Windermere, between Troutbeck Bridge and Ambleside. Enjoy the free adventure playground, or the new tree top adventure (similar to go ape). There is also canoe hire, crazy golf and other activities for all ages. Best of all, it is all right next to the beautiful lake Windermere. There is also an information centre, with good pushchair and wheelchair access. Free admission. Pay and display car park. The coast is about 45 minutes by car. Manchester Airport is about 1 hour and 15 minutes by car. For those rainy days the house boasts the full SKY SPORTS & MOVIE package both upstairs and down. Lake District Visitor Centre - Brockhole 50 metres - enjoy the adventure playground, lakeside setting, exhibitions, fabulous gardens, information centre, gift shop and cafe. Free admission. Cycle hire by Windermere station 2 miles. There are over 50 restaurants to choose from between Ambleside and Bowness. No smokers and no pets please. Booking Notes: Please note : 3 night weekend stays cost 75% of the weekly price. 4 nights is 80% and 5 nights 85%. 20% payment to be made at time of booking plus £300 refundable deposit. Payment of full balance to be made 6 weeks before booking commences. Changeover Day: Friday. Social Media: We have special offers running throughout the year so please follow us on Twitter at @ecclerigggarth or Facebook at Lake District House To Rent for regular updates. Please send us your photos and feedback as well of your stay!